Unable to Join the Flight? Consider joining the chase team on the ground. And if your group has a Balloon + Brunch package, then enjoy after-flight brunch as C’Casa. The fun isn’t just for those in air. The inability to fly doesn’t mean you can’t join in on the adventure. Anyone with a fear of heights or medical condition prohibiting flying can still enjoy their time with our balloon ride chase package option. As a Chase participator in the Balloon Flight packages, you will arrive with your whole group at Model Bakery in the morning, enjoy some preflight/pre-chase coffee and fresh pastries, and then ride to our launch site. 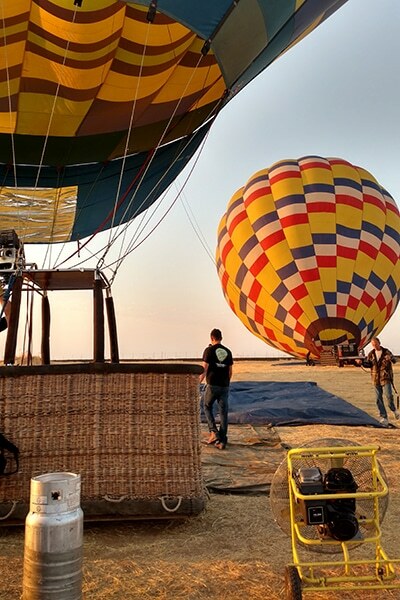 From there, you will watch our balloons take off and have a chance to get some amazing ground shots. And if your group has a Balloon + Brunch package, then enjoy after-flight brunch as C’Casa.